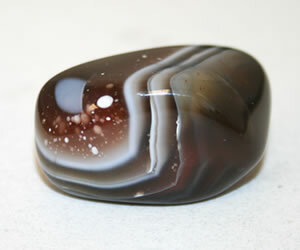 Multi-Eye Agate is a nodule that has a large number of eyes, often of different size and structure. 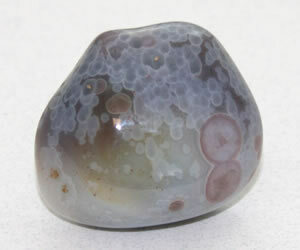 This specimen of Botswana Agate is a small nodule of about one inch in size that has an enormous number of eyes that were just under the “husk” of the nodule and revealed by polishing. Granite is not often seen as a tumbled stone, but it can easily be tumbled into beautiful stones – despite its being made up of multiple minerals of different hardness. Granite is an igneous rock composed of feldspars, quartz, mica, amphibole and other minerals. These specimens are from the Ohio River gravel deposits. 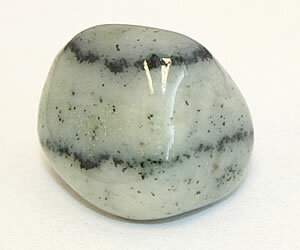 Contrasting Chalcedony is the best name that we can give to this rock. 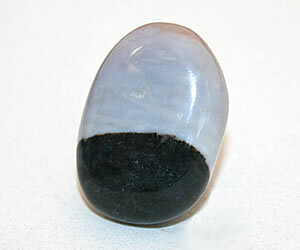 It is composed of white chalcedony in sharp contact with black chalcedony. It is about 1 1/2 inch long. Tumbled stones like this one are rare. 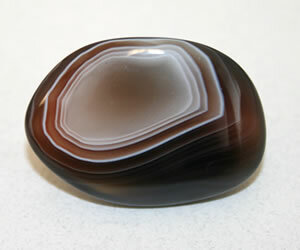 Banded Botswana Agate often has bands of many different widths. 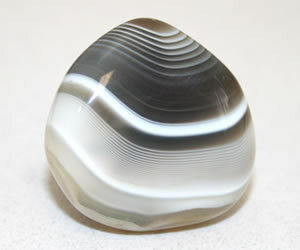 This specimen is about one inch across and has very finely-banded white agate with interbands of clear chalcedony. The bands are so thin and the clear agate so transparent that they seem to produce a “holographic” image when you try to peer through the stone. 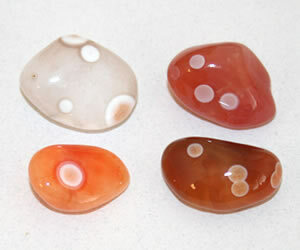 Gemmy Chalcedony is an informal name that we give to chalcedony that has a solid beautiful color. 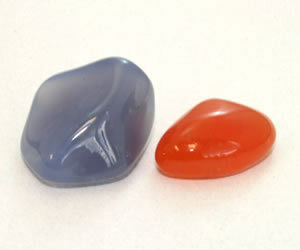 Here we have a specimen of blue chalcedony and a specimen of orange carnelian. Both of these are so gemmy that we feel that they should be sliced, cut into cabochons and made into jewelry to make maximum use of their beautiful color. Brazilian Agate is a name usually given to concentrically banded agate nodules harvested in stream valleys that cut through basalt flows in Brazil. They can be very colorful and make nice tumbled stones. 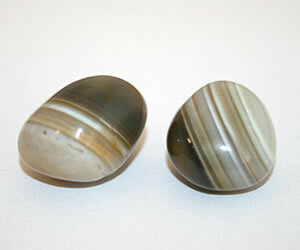 Here are a couple of very nicely shaped tumbled stones made from an olive brown Brazilian material with white bands. Gold Tiger Eye is very popular as tumbled stones. This dark brown to gold specimen has thin bands and a very nice chatoyance (an optical sheen that is produced when light is reflected from a stone with a fibrous texture). 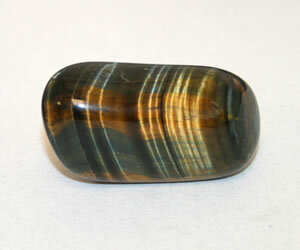 Tiger eye is one of a very small number of stones that exhibit chatoyance. Two Big Eyes are the striking feature of this beautiful tumbled stone. It is a gray Botswana agate that formed with a few big eyes under the husk. The eyes are concentric with a yellow brown pupil surrounded by a thick band of white agate. Not Quite Eyes is what we said when we found this beautiful orange agate that upon first glance we thought had eyes. But, closer examination showed a very irregular outline which disqualifies them from being eyes. 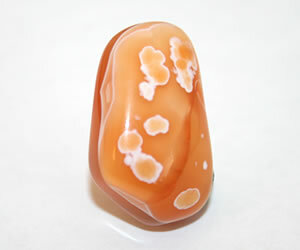 Orange Botswana is the color that you see in the center of this agate nodule. Each band closer to the center takes a color gradient step towards an orange-pink color. 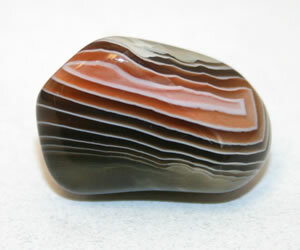 Red Tiger Eye with adjacent bands of white quartz and brown tiger eye. The band of white quartz might be a fracture filling material. When it crystallized the fibrous texture was replicated and pieces of gold tiger eye debris was incorporated. 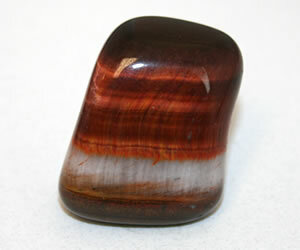 This type of feature is rarely seen in red tiger eye or tiger eye of any other color. 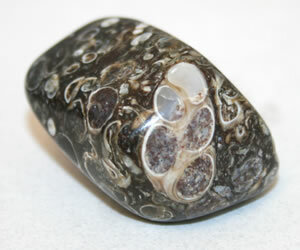 Turritella is a variety of agate named after a genus of sea snails. The agate forms around and within an accumulation of turritella shells. When the agate is broken and polished the internal structure of the shells is revealed. 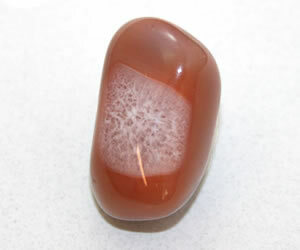 A novelty agate. 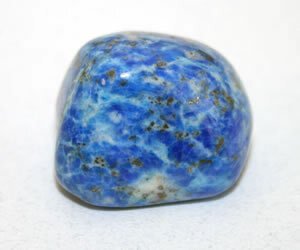 Lapis Lazuli is a bright blue gemstone that has been treasured for thousands of years. It is one of the few gemstones that can be accurately described as a “rock”. Lapis Lazuli is a rock because it is composed of multiple minerals which always includes lazurite (a bright blue feldspathoid mineral), but can also include calcite (usually a white carbonate mineral), sodalite (a dark blue feldspathoid mineral), pyrite (a metallic gold sulfide mineral) and numerous other ingredients. This specimen from Chile is especially colorful and about 1/2 inch in size. 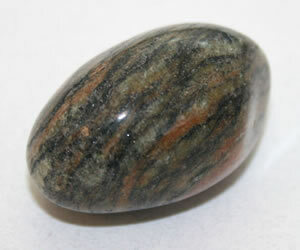 Fancy Jasper is a name used for a jasper that has very colorful markings but has not been given another formal name. 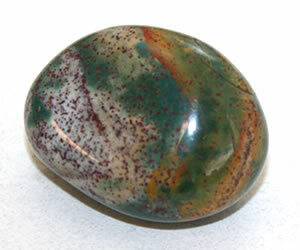 The name Bloodstone is used when a jasper with a green base color is splashed with tiny droplets of red “blood”. This specimen from India is about one inch across. 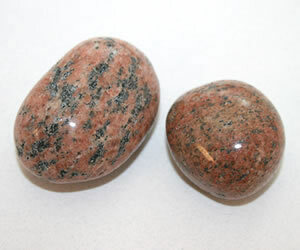 Gneiss (pronounced “nice”) is a metamorphic rock that is not often seen as a tumbled stone. It is formed when a sedimentary or igneous rock is subjected to high enough levels of heat and pressure that mineral grains in the rock become elongated and segregate into compositional bands that are perpendicular to the direction of stress. This specimen is a piece of granite gneiss is from the Ohio River gravel deposits. Crystal-Center Agate Nodules form when the final crystallization stage of an agate nodule produces coarsely-crystalline druzy quartz instead of the microcrystalline variety of quartz known as agate or chalcedony. This specimen is about one inch long. Fancy Jasper is a particularly colorful jasper. 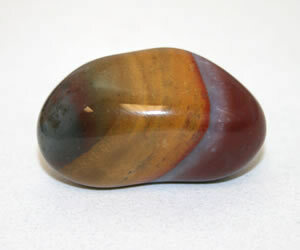 This specimen of fancy jasper from India has bands of sharply contrasting red, white, yellow and green color. Amethyst is a purple variety of quartz. As a member of the quartz family it is often found in six-sided (hexagonal) crystals. 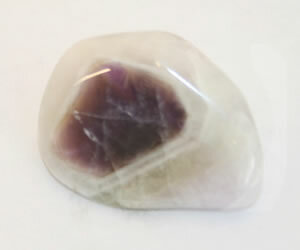 This tumbled stone was produced from a crystal fragment. The crystal had an outer layer of white quartz over an amethyst core. The crystal broke at an inclined angle and the cross section of the amethyst portion seen here is an irregular six-sided polygon. 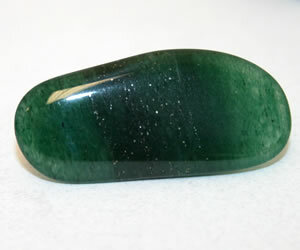 Dark Green Aventurine makes gemmy tumbled stones. This piece contains lots of tiny pyrite crystals that can be seen as the tiny dots in this photo. When viewed under a microscope they can be identified as framboidal pyrite (tiny spherical aggregates of euhedral pyrite crystals). Most green aventurine is much lighter in color than this specimen. 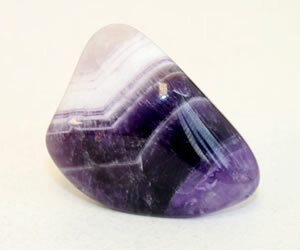 Banded Amethyst can be tumbled into beautiful stones. It is typically fragments of large quartz crystals that are either amethyst overgrowing a white quartz crystal or an amethyst crystal overgrown by white quartz. In this example we can see that white quartz is the younger material and was overgrown by deep purple amethyst to form banded amethyst. Banded Gneiss is a metamorphic rock that forms when rocks are exposed to directed heat and pressure. The rock displays bands that are oriented perpendicular to the direction of principle stress. This is a beautiful specimen of a white tightly-cemented quartzite with very thin and very distinct bands of dark heavy minerals. You don’t fund a tumbled stone like this one very often. 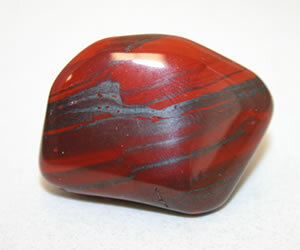 Banded Iron Ore is a rock that is often composed of alternating bands of red jasper and silver hematite. Most specimens formed early in Earth’s history, during Precambrian time, when the oceans were rich in dissolved iron. At that time some of the first photosynthetic plants were contributing free oxygen to Earth’s atmosphere. Some of this free oxygen rapidly combined with the abundant iron in sea water to form iron ore. Today, Earth’s oceans have been depleted of dissolved iron and the cars that we drive are made from iron ores that are gifts from the first photosynthetic plants. Blotches in Botswana is what we call this rock. It is a nice piece of Botswana agate that has a wide band of brown transparent agate that contains tiny suspended spheres of a white agate. One of the most interesting tumbled stones that we have ever seen. Root Beer Botswana is our name for this rock. 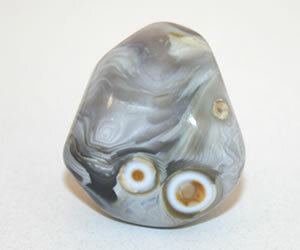 It is a beautifully tumbled partial nodule of Botswana agate that has a deep root beer color on the outside and concentric white, gray and brown agate bands on the inside.